19°C, light cloud with a SW breeze. There is a great upland route near Glen Finnon. It’s a horseshoe of peaks that includes two Munroes, a long undulating ridge and magnificent views of glens, mountains including Ben Nevis, and views out to sea of the isles of Eeig & Rum. I could find no proper campsite near the route’s start so I chose a spot for a wild-camp. It was fairly near the road on a col that looked deserted except for a trainline that carried a steam-train twice a day. With a site selected, I put up the tent rather later than usual after cooking & eating supper first. Discretion is the rule here, put up the tent at sunset & take it down as soon as you can after sunrise. I bedded down at about 10pm and read for a while. 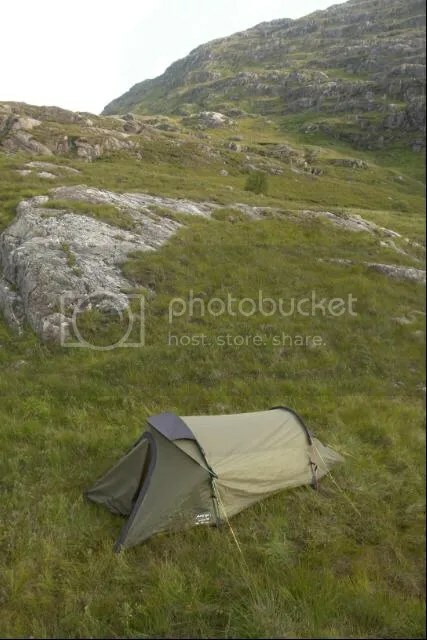 The ground was a ripe breeding ground for midges and some got into the tent & bugged me while I lay there reading my book. Some of those midges are still there, adding punctuation to the story. Later in the night, probably about 2am I was woke suddenly to an animal sound. A loud deep sound that was quite percussive. Despite choosing a spot out of view for humans, it wasn’t so hidden from deer. I’m still naive about deer, I lay there heart thumping when the sound came again. A sudden burst of air somewhere between a grunt & a snort. Clearly the sound came from a big pair of lungs. My fear cortex ran overtime & I could picture a scene where a herd was making its way along old tracks that they have used for decades. All it would take is a slight disturbance and they would gallop in the dark in fright. There I lay, in a tent made of light thin fabric and only a summer weight sleeping bag for protection. Deer hooves are sharp, they use them for defence. These thoughts occupied the front of my mind. Strangely in all of this, Rosie my trusty dog wasn’t too bothered. I decided to take the situation onto my own hands and got out of the tent with a torch. Good, they weren’t in immediate sight, so I scanned the horizon and hillsides with the beam. The stars shone brilliantly, the midges bit my bare legs but only one pair of eyes shone back in the darkness. After a short moment, even they were gone. Relief, they have fled. I stole a moment to look up at the filigree milky way and Cygnus blazing brightly overhead while the midges finished their meal. I did eventually settle back to sleep though woke once more to pee. This time, peace, I could enjoy the image of a thin cresent moon next to the fixed brilliance of Venus as a morning star. There was another planet nearby but I don’t know what it was (probably Jupiter). A big day lay ahead, a very long walk was the reason to camp in such a place so I grabbed more sleep. The day went on from there as planned. This entry was posted in Hiking, No category, Travel and tagged Ben Nevis, camping, Camps, Midge, outdoor, Scotland, Tent, Walking. Bookmark the permalink.